Say hello to the Year of the Yin Fire Rooster. There’s no doubt in my mind this will be an interesting year. 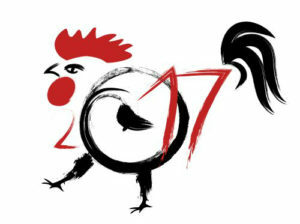 Perhaps we’re all ready to treat this Rooster year as the global wake up call, rousing us into action. Rooster is a bit flamboyant and persistant, but also action-oriented, and encouraging the capacity to voice one’s truth and embody self-respect. Like all of life, things are nuanced and often paradoxical, and so, too, I expect this year will be as well. Yin energy tempers some of the cocky Rooster energy and I’m betting we’ll see lots of the influence of women and Divine Feminine energy coloring things this year. All in all, I think we’re in for a fast-paced year with lots of surprising developments. Instability and changeability are things we need to be mindful of; and we’ll want to find ways to channel that fiery energy into productive directions and things – things we’re truly passionate about. Perfect! I have just the thing. I’ve created an auric spray for the Year of the Rooster. Move intentionally through this year with determined awakened energy. 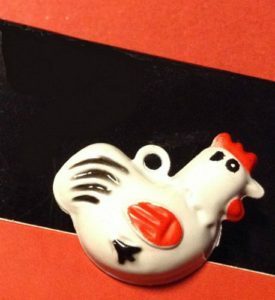 And look – I’m including a tiny rooster charm with each bottle. Isn’t it adorable? It also happens to be a jingle bell. What perfect energy for Rooster who wants to be noticed! It’s a sweet reminder to help you focus, and to honor our ally who is escorting us through this year. Fair notice warning though, I have a very limited supply of these charms, so if you’d like one you might not want to wait too long to order. Each 2 oz. bottle comes with instructions for use, and an affirmation you can use to inspire you. Packaged in a sparkly red bag. Get yours and enjoy!